As with any other hobby and craft, it is crucial that you are properly prepared and equipped for sewing before diving into a brand new project. Keep in mind that if you want a more satisfying and lasting experience as a sewing enthusiast, you will need to invest in some good quality sewing equipment and materials for your sewing kit. Here is a quick guide of the essential equipment, tools and materials which you need in order to start up your brand new sewing kit, in order to feel comfortable and perform at your best once you undertake your first project. This will be your biggest investment for this new hobby, so make sure that you choose and invest wisely. The higher the quality of the machine – the better your performance will be, and the longer you will enjoy using it. Modern, good quality machines have various options which can be very helpful for beginners, such as: automatic settings, easy control by hand or foot as well as easy threading, cutting and other functions. 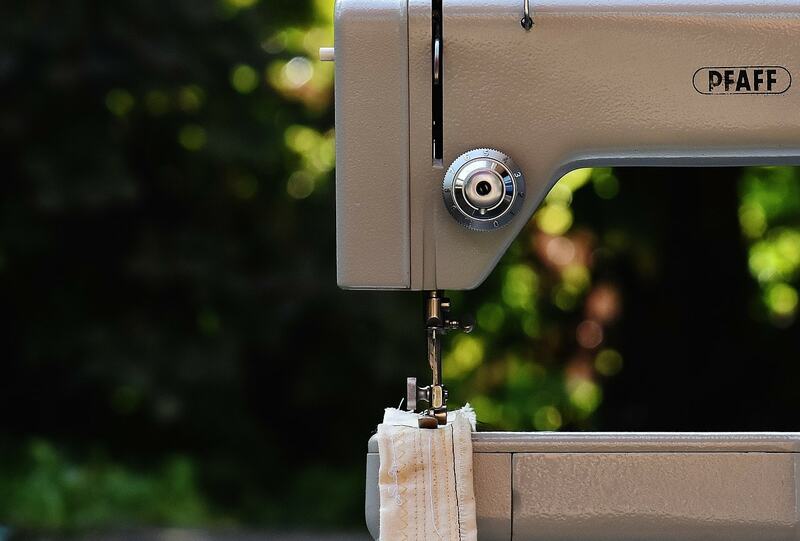 If you are still unsure that your new hobby will stick, it is advisable that you ask a friend or family member to borrow their sewing machine for a few test runs before proceeding to buy one of yours. Alternatively check out our top sewing machines reviews with models suitable for general sewing, embroidery or quilting, as well as the best models depending on your skill level, interests or the main fabrics you will handle. Yes, mistakes happen when you proceed with your projects! This is why having a good and reliable seam ripper. Don’t worry – even the pros and the sewing enthusiasts with years of experience always have a seam riper handy, because mistakes can always happen, and making corrections to the seams and stitches is part of the craft. A seam ripper will help you remove any messed up stitches safely, so that you can do them properly over again. Good quality, sharp scissors are a must in order to properly cut the garment for your sewing projects. It is essential that you get a good pair of scissors for your sewing kit and use them for cutting fabric only, in order to keep them sharp for a better and more precise performance. Don’t be tempted to use them for cutting paper or other materials, because the shears will become dull and working with them will become an annoyance and will ruin your precious fabrics. These will come in handy each time you need to cut short threads or rip out messed up seams as you proceed with your project. Measuring tape is essential if you want to create proper garments to fit the body dimensions you are making them for. Having a measuring tape is useful for all stages of the sewing project, especially for the initial design, marking, cutting and other preparations. This useful tool will allow you to easily cut out even the most complicated patterns. It will allow you to lay the fabric flat on the surface of your sewing table, so that you can plan out, mark and cut the design you need properly and with great precision without worrying that your design paper will shift from the fabric and that you will make a wrong cut. Pretty soon after you start up your new hobby you will find that you will often happen to make cuts to your sewing table while cutting your fabric especially if you are using a rotary cutter. In order to avoid ruining your furniture, a self-healing mat is an essential item you should purchase. Whenever you make a deeper cut, turn the mat over so that you avoid cutting in the same place and making the cut deeper through the mat. Never use a regular pen, marker or pencil for making marks on your fabric, because chances are – they will leave permanent marks on your unfinished project. Instead, use magic tape and fabric chalk, chalk pencils or water-soluble ink. Even though you already own an iron, it is a good idea to get another one to keep in your sewing area for easier and quicker access. You will need the iron to press the fabric before starting work on a new project as well as for pressing the seams as you proceed with the sewing. Pressing the seams as you go will allow you to keep the stitches straight and to properly complete the design you have undertaken. Despite the fact that you have a sewing machine, hand sewing needles are essential for a wide variety of tasks during each project you will be working on. They will be needed for some fine finishing touches, for sewing buttons on as well as for many other tasks which can’t be done with a machine. This small simple tool will save you a massive amount of energy, time and frustration from having to thread needles. You will need only a couple of seconds to get the thread in even the tiniest needle eye with this clever little tool. Safety pins are used along with the normal pins quite a bit. Safety pins are essential to keep the patterns down to the fabric as well as for keeping cords in place and as guidelines while you are sewing. You need to have replacement needles, because they can break. Also, different fabrics and tasks require different types of needles, so make sure that you buy a good set of needles before you proceed with the sewing projects. Such a simple thing as a pin cushion is absolutely essential for easy and safe access to all those pins you will be using while working on your project. Keeping the pins on a pin cushion will save you from having to pick them off of the table or from having to hold them in your mouth which can be quite dangerous. Tweezers are very useful for pulling out threads which you need to cut, which will happen more often than you think once you start working on your sewing projects. When you are working with very delicate fabrics, you certainly don’t want to use pins or safety pins to hold the pattern down, which is why getting some pattern weights is highly recommended. They come in a wide variety of types, colors and sizes. If not, you can use canned food, penny rolls or small bags of rice to hold down your patterns too. They are slightly more expensive than normal plastic head pins, but glass head pins are much easier to glide into all kinds of fabric and more importantly will not melt when you press your fabric. This is very useful especially if you have difficulties keeping a straight line when sewing. Use some painter’s or other colored tape to make sure you never sew a crooked line again. Having an acrylic clear ruler is very convenient when you want to see where the markings are while sewing and will help you become much more accurate. As a beginner you may want to start out by buying two large spools of black and white thread. You can move on to getting other varieties and colors as you proceed with your future projects. Always read the recommendations for the type of thread to use in your sewing machines’ manual. Keep track of which types and brands of thread work better with your machine, so that you can stick to your choice and get more thread from the same kind when you run out. Invest in a good and comfortable ironing board, so that you can accurately and safely press your fabrics and garments while you are working with them. Make sure you buy some cheap muslin so that you can pre-test your design patterns before you proceed to work with the actual fabric. You can use other cheap fabric for this if you happen to stumble upon a sale too. These are the first bit of essential sewing tools which you will need for starting up your sewing kit. Once you start working on more projects, you can gradually add more tools and items to your kit. It does involve a bit of an investment, but all of the abovementioned items are crucial if you want to become a serious sewist and make beautiful garments and other designs. You will find that soon adding each new item to your sewing kit will turn into a much valued experience, and that you will start enjoying looking for additions to your sewing supplies as much as the experience itself! So, go ahead and start up your brand new sewing kit today!